EC mirror stands for electrochromic mirror. (a) Push the cover in the direction indicated by the arrows (a) and remove it. 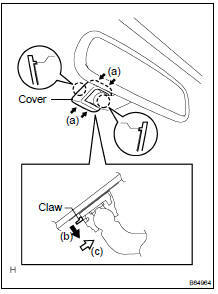 (b) While holding down the claw in the direction of the block arrow (b), slide the inner rear view mirror assy in the direction of the while arrow (c) and remove it. (a) Remove the mirror cover. (c) Using a torx socket wrench (T20), remove the screw. (d) Slide the mirror in the direction indicated by the arrow in the illustration, and remove the mirror.